eConowind offers a wind-assisted ship propulsion unit based on the suction wing principle. Two foldable Ventifoils generate force, reducing fuel consumption and thus leading to cost and emissions reduction. The containerized version can be installed in just one hour. The application will be explained, including some aerodynamics giving the high force relative to its size. For precise efficiency and energy consumption measurements of hybrid ships you would need a combustion analyzer, a power analyzer and dataloggers for mechanical parameters. We invented a ruggedized power analyzer that combines the functionality of all these systems for testbeds and also for real-drive tests. It can measure any kinds of signals (electrical, mechanical, digital, video, etc.) and the powerful software allows power and combustion analysis at the same time, which is unique in the market. The analyzers can be synchronized to place them close to the point of measurement, to achieve a reduction in cable length and measurement errors. The use of batteries and accumulators to store energy is increasing enormously. For developers and test engineers in power conversion, testing the power electronics needed for power conversion is quite a challenge. The use of a battery emulator that behaves exactly like a real battery pack gives optimal flexibility. With a well-programmed emulator, the battery voltage depends, just like the real battery, on the state of charge, the charge and discharge speed, and the internal charge and discharge resistance. In addition, a battery emulator offers a high degree of flexibility due to its programmability during the execution of the various test phases in the R&D lab and during production. Last but not least, you save space and safety is more manageable. Vessel operators around the world are considering hybrid propulsion systems given the many proven solutions in the marketplace. In this presentation, we will highlight feasibility and lifecycle cost analyses that helped Washington State Ferries move forward with electrification. The lifecycle cost analysis assumes that technology is static over the long life of the vessel. However, expected improvements in technology will reduce the lifecycle costs even further. Improvements in the near term include the current lithium-ion technology as well as solid-state and silicon anodes. Game-changing technologies on the horizon include lithium-sulfur, lithium-metal and lithium-air. Hybrid and full electric power systems are increasingly popular in smaller coastal and river vessels. With limited space available onboard, the power system needs to be highly compact, robust and reliable. To answer these needs, ABB has developed a fully integrated power system unit packed into a compact enclosure housing, consisting of drives for power generation, shore connection, battery energy storage, propulsion and other motor drives, AC network supply as well as an integrated control system. The self-service unit can sit freely in the engine room, and the DC distribution allows fuel cells or other energy sources to be added later on. The optimization of ships' engines on the basis of the highly precise and reliable T40MAR torque sensor from HBM enables considerable fuel savings and is also in line with the constantly increasing demands of international regulations. T40MAR is HBM’s torque flange that was specially developed and certified for use in ship propulsion systems. Its measurement accuracy enables the calculation of load signals with at least 10 times higher accuracy than required by the shipping industry’s current environmental regulations. Offshore rigs and vessels can be seen as a remote micro-grids. By making use of smart hybrid- or full-electric energy management solutions, efficiency, as well as operational costs and environmental impact, can be significantly reduced. This presentation focuses on Bosch Rexroth solutions and the following main topics: automatic synchronization with generator(s); providing a DC load bus next to an AC load bus, thus creating a local DC grid; reducing peak power demands from grid (peak shaving); providing backup power in case of main power grid failure. Globally there is a big drive to introduce more automation and autonomy in marine and maritime, particularly through the exploitation of recent advancements in the application of artificial intelligence (AI) to solve challenging problems. Although much of the focus has been on solving automation/autonomy challenges for navigation systems, there has been limited thought about how to approach the engineering spaces, particularly the main propulsion and auxiliary power units. In the work presented here, an AI-enabled condition monitoring system developed over the past five years for all scales of marine diesel units, and rotating plant machinery more generally, is showcased. ZEETUG – Zero Emission Electric Tug Boat – is the world's first rechargeable fully battery-powered harbor tug boat. One ZEETUG is currently in service in the Tuzla region near Istanbul, Turkey, and another three are under construction. The boat is capable of more than 30 BT pulling power while significantly improving operational efficiency and maintaining the optimum the asset lifecycle. As a designer and manufacturer of SOLAS-compliant high-temperature insulation systems, we developed a battery housing that addresses the high safety requirements of the marine industry. By applying our expertise in high-temperature insulation and fire protection measures, various safety features have been developed to address the market needs. The presentation will show the development process and its results. In offshore construction, steps are taken to reduce the harmful emissions of the ships, but what about the temporary power supply for project-specific equipment? In cooperation with Boskalis and Energyst, EST-Floattech performed a case study in which the benefits of a hybrid system are studied. 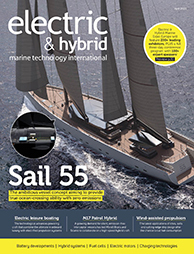 Why are hybrid installations (in Yachting) so challenging?